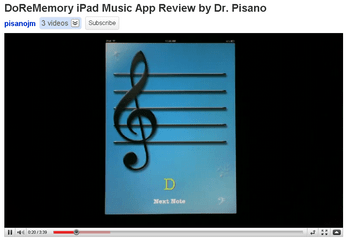 mDoReMemory is a music educational app created to teach early pianists where notes belong on the treble and bass clef staffs. This app takes a unique approach. You are given the name of a note. Then you tap where you think that note should be on the staff. When you are correct, the note shows up, the correct pitch plays, and stars twinkle. When you don’t tap the correct spot, an arrow directs you to the right location. There is no penalty for incorrect answers; just try again or move on to the next note. And, since there is no timer, you can take your time without feeling rushed. This app includes treble notes from middle C to a high G and bass notes from middle C to a low F. Middle C is the only ledger line note included. To switch between clefs, tap the treble or bass clef symbol in the lower corners of the screen. This is a great application for practice with learning the Names of the notes on the Treble and Bass Clefs. It is clean, functional, and user-friendly. While, I would love to see this application include a better feedback/challenge system for the students, it does exactly what it sets out to accomplish. Caveats/Suggestions: I would love to see a better feedback system for positive reinforcement over time (maybe a dozen correct notes, etc.). Also, possibly the inclusion of the Alto Clef(s) for slightly older students starting on the viola, etc.